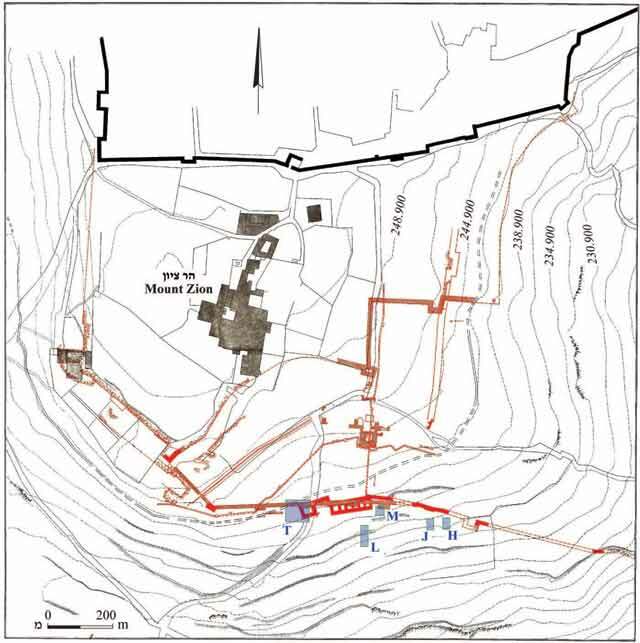 During February 2007–April 2008, an excavation was conducted on the slopes of Mount Zion (Permit Nos. A-5023, A-5338; map ref. 221791/630753), prior to the construction of a promenade along the southern slopes of Mount Zion. The excavation, undertaken on behalf of the Israel Antiquities Authority, at the initiative of the Nature and Parks Authority and underwritten by the El‘ad Association, was directed by Y. Zelinger, with the assistance of T. Grunwald (area supervision), Y. Ohayon and R. Abu Halaf (administration), V. Essman and V. Pirsky (surveying), T. Sagiv (field photography), the Sky View Company (aerial photography), C. Amit (studio photography) and D.T. Ariel (numismatics). Five areas were opened (Fig. 1, based on F.J. Bliss & A.C. Dickie, Excavations at Jerusalem from 1894-1897, London 1898); three areas (H, J, L) were probe trenches in layers of soil fill and debris outside the line of the city walls throughout the centuries. 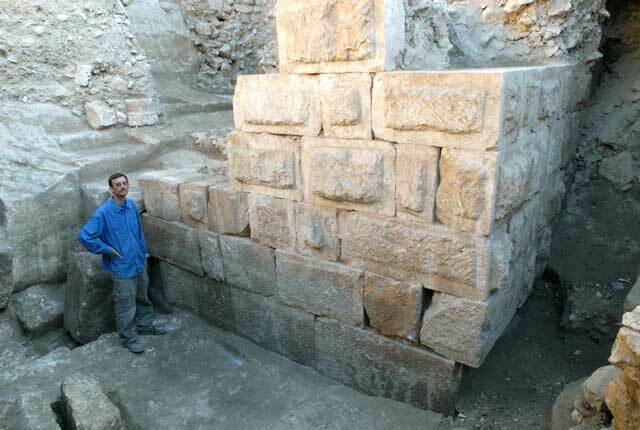 Remains of Jerusalem’s southern wall from the Byzantine and Hasmonean periods, and probably also from Iron Age II, were exposed in the two other areas (M, T). Mechanical equipment was not used in the excavation areas, except for Area T where a backhoe cleared away later debris. Following the current excavation, subsequent fieldwork was carried out west of Area T (HA-ESI 121). The wall enclosing Mount Zion from the west and south was first discovered by Maudslay in the area of Bishop Gobat’s school; however Conder was the first to publish it in 1875. The largest part of the city wall was identified and excavated in 1894–1897 by an expedition, on behalf of the British Palestine Exploration Fund, under the direction of the American scholar F.J. Bliss and his British architect, A.C. Dickie (Fig. 1). Their method of work involved digging a series of shafts and tunnels next to the outer face of the city walls. Their publication included photos, detailed plans and clear sections of two systems of fortifications, built one atop the other, which they dated to the Byzantine and the Second Temple periods; their dating was almost entirely based on historical sources. Another excavation was directed by Hamilton in 1934 close to the city wall line, when Bishop Gobat’s school was enlarged, and a gate dating to the Byzantine period was exposed south of the Shiloah Pool in another excavation, directed by Kenyon in the 1960s. Pixner, Chen and Margolit (ZDPV 105, 1989, pp. 83–95) re-examined Gate N (according to Bliss and Dickie’s designation) in 1979–1986 and discerned three thresholds that dated to several periods. This largest of the areas is located west of the Catholic cemetery (Figs. 2–4). Fortification remains from the Byzantine and Hasmonean periods, and probably from Iron Age II as well, were exposed—three periods during which Mount Zion was enclosed within the city wall. The current excavation revealed the course of one of Bliss and Dickie’s tunnels close to the southern face of the Byzantine wall and next to the Hasmonean tower. Their tunnels interfered with the excavation because they were as high as the height of the fortification remains and separated the remains from the ancient debris that abutted them. Within the tunnel and next to the Byzantine wall were remains from 110 years ago, including beer bottles, the sole of a shoe (Fig. 5) and some sheet metal that was used in roofing the tunnel. The fortification from the Byzantine period is the main architectural element in the area, consisting of a wall and a tower. 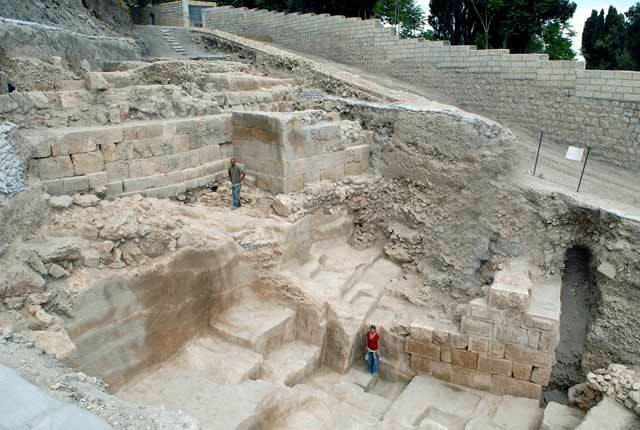 Most of the fortification was founded on the bedrock but parts of it were placed on fill containing potsherds that dated mostly to the Second Temple period and Iron Age II. The wall (W2018; height 2.8 m, width c. 2.5 m; Figs. 3, 4, 6) was built of two rows of large, well-dressed stones with a core of debesh that consisted of small and medium stones, as well as mortar. Its base was leveled with a layer of fieldstones (height 0.2 m) placed on the bedrock. Five courses were preserved above the leveled layer of fieldstones; the bottom two courses were foundation and the upper three were remains of the superstructure that protruded above the surface. Most of the stones in the upper courses were uniformly dressed and their entire outer surface was smooth, without drafted margins. It seems that they were dressed specifically for the construction of the city wall. In contrast, a uniform stone style was not maintained in the lower courses and some of the stones were worked in a more ancient manner and incorporated in the city wall in secondary use. Each of the two bottom courses is set back c. 0.1 m from the course below it, similar to other sections of the wall that had been exposed in the past. The tower consisted of four walls with stone and earth fill between them. The northern wall (W2002; height 2.8 m) was built of four courses of large fieldstones (height of each course 0.7 m). This wall, solely meant for engineering purposes, was not visible. Therefore, it was probably not built of dressed stones that are familiar from other parts of the wall. The southern wall of the tower (W2006; height 2.5 m), which faced outside the city, was built of five courses of well-dressed stones (height of each course 0.5 m), founded on a layer of small fieldstones that leveled the bedrock. The construction method of the tower differed from that of the city wall in having no difference between the upper and lower courses from a standpoint of stone dressing and the courses were not setback from the line of the wall. A rock-hewn cistern was discovered below the Byzantine tower and above the cistern were the remains of a built vault. The fill in the upper part of the cistern contained mostly potsherds from the Byzantine period and only potsherds from the Herodian period were discovered in its bottom part. Based on the ceramic and numismatic finds and an analysis of the stratigraphy, the cistern was used for storing water inside the fortified city from the Hasmonean until the end of the Second Temple periods. It ceased to be used at the time of the city’s destruction in 70 CE and was blocked when the Byzantine wall was built so as not to interfere with the construction. A plaster floor abutted the northern side of the Byzantine W2018 (L2021; Fig. 4) and twenty-seven coins were found in the fill beneath it, the latest dating to the end of the first decade of the fifth century CE. These finds, as well as the ceramic finds discovered below the floor, date the construction of the wall to the time of Eudocia and corroborate the dating proposed by Bliss and Dickie. This dating is in keeping with the writings of the sixth century CE chronicler Johannes Malalas, who mentioned that Mount Zion was encircled with a new wall at the empress’ initiative. He wrote that the empress decided to build the wall because she interpreted the verse “Do good to Zion in thy good pleasure; rebuild the walls of Jerusalem” (Psalms 51:20) as a direct appeal to her. The Hasmonean fortifications. The southwestern corner of a tower was exposed south of the Byzantine wall (W2061, the tower’s casing; width 0.8 m, max. height 3.3 m, length of western side 6.5 m, length of southern side 4.0 m; Figs. 3, 4, 7). The remains of the trial trench that Bliss and Dickie excavated, which collapsed during the last century, extended alongside the outer face of the tower, for the entire height of the preserved wall. Wall 2061 is a casing for the fill that was in the tower’s interior foundation. None of the wall’s stones survived in the northern part of the western face (for a distance of 2.5 m), but the rock-cuttings in bedrock indicate its route. The six wall courses that had survived (each 0.55 m high) were built of dry construction. The two bottom courses consisted of roughly worked ashlars that had drafted margins and were neatly dressed in the center of the stone’s surface; the rest of the courses were built of ashlars with drafted margins and a prominent boss in their center. Bliss and Dickie thought that the different kinds of stone dressing were indicative of construction and renovation phases when the tower was used in the Second Temple period; however, it seems that all the courses were built in one phase and they differed from each other because the bottom courses formed the foundation that was not visible on the surface, whereas the upper courses were above the surface and therefore built in accordance with the method customary in the Hasmonean period. The tower was founded on bedrock after it was quarried and made fairly level. A quarry was discovered at the foot of the building and the stones were probably removed from it for the construction of the tower. The northern side of the tower adjoined a vertical rock-cutting (height 1.7 m), above and north of which were the remains of an earlier wall, probably from Iron Age II (see below). The city wall in which the tower was incorporated was not preserved; however, it can be assumed that it was built on top of the ancient city wall. Only disturbed floors that abutted the tower were found in the excavation and thus, archaeological means for dating it are lacking. It was most likely part of the ‘First Wall’ that was built, according to Josephus, by the Hasmonean kings. According to the Book of the Maccabees (I 10:10), Jonathan began building a city wall around Jerusalem and it was completed during the reign of Shimon or John Hyrcanus. Iron Age II (?) fortifications. Remains of another fortification wall (W2082; width 3 m, max. height 0.8 m; Fig. 8) were found above the rock-hewn terrace that was abutted by the Hasmonean tower. The northern and southern sides of the wall were built of large boulders with a core of various size stones. The southern face of the wall was set on the line of a quarry that descended c. 3 m toward the slope and the northern face was also placed on a line hewn in bedrock. The western part of the rock-cutting that faced north was plastered. At first glance, it seems that W2082 was part of the Hasmonean wall, with the tower enclosed by W2061 (above); however, in light of comparative analyses of their respective methods of construction, it can reasonably be concluded that they were not contemporary. The Hasmonean tower was founded on bedrock after it was trimmed and made level, whereas the foundations of the city wall to its north were set on bedrock which was not prepared and in its eastern part even pockets of bedrock that contained terra rossa soil had remained. This method of construction is different from that of the Hasmonean tower and of each of the sections that were discovered of the ‘First Wall’; therefore, it is probable that this is earlier construction. The manner of placing the base of the wall and the use of massive stones to delimit it is consistent with Iron-Age construction that is known from other places in Jerusalem. A probe (1.5×1.5 m) was excavated in the core of the wall, with the aim of dating its construction, yet no datable finds were discovered during the excavation or the wet sifting that followed. At this point in the excavation the data is insufficient to determine unequivocally if these are the remains of Hezekiah’s wall that encircled the western hill in the Iron Age, or the remains of the ‘First Wall’ that are dated to the Hasmonean dynasty. However, an examination of the construction method supports the earlier dating. Based on the location of this wall relative to the Hasmonean tower, it is plausible that the Hasmonean wall was built along the same route, atop the remains of the earlier wall; this hypothesis is further reinforced by Josephus’ description of Jerusalem’s walls (The War of the Jews 5:4, 2). Five squares (4×4 m each) were opened next to the southern wall of the Catholic cemetery, where the line of the Byzantine wall that Bliss and Dickie discovered was thought to pass. The southwestern corner of one of the towers that they had uncovered (no. 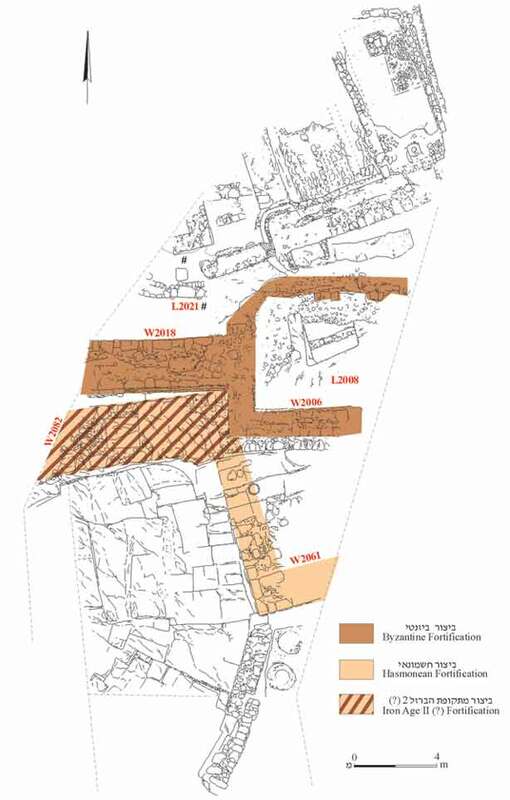 5) was found in the western square and their tunnel (width 0.6 m) was revealed next to the southern side of the tower. The tower wall had been robbed in antiquity and only one of its courses (height 0.5 m) was preserved. It was built on a foundation of cement mixed with stones (thickness 0.4 m), which was placed on top of a thick layer of soil that had accumulated on the slope and dated to the Second Temple period. The core of the tower was built of light debesh that comprised fieldstones with practically no mortar between them. A drainage channel (depth 0.5 m) that emerged from inside the city, going beyond its borders toward the Valley of Hinnom, was integrated in the base of the tower. The two areas (J in the west and H in the east; each 3×6 m) are c. 40 m apart and positioned south of a prominent terrace wall. It was thought that the terrace, built between the southern border of the Catholic cemetery and the western border of the Jewish cemetery (the Sambuski), maintained the line of the southern city wall. A layer of material that had washed down the slope was exposed on the bedrock in Area J; it consisted of earth mixed with stones and potsherds from various periods. On the layer of silt in the center of the area was a wall, one course high, which may have replaced the line of the terrace to its north in a later period. A similar phenomenon was discovered in Area H—a layer of earth mixed with stones and potsherds (max. thickness 1.8 m) and a toppled wall in the middle of the area. It is presumed that the wall was part of the terrace uncovered in Area J. The slope in Area H is very steep and the difference in depth between north and south exceeds five meters. 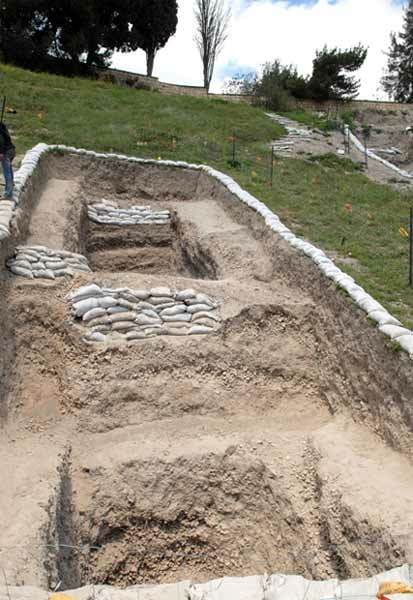 The two areas did not yield any remains of fortifications and were backfilled with soil and blocked at the end of the excavation. This area is a deep section trench (3×14 m; depth 4.5 m; Fig. 9), oriented north–south and located on the steep slope south of the Catholic cemetery. The aim of the excavation was to explore the extent of the inhabited area in the south of the city, outside the city walls. No building remains were discovered in the section, which consisted only of layers of soil and stones that contained numerous potsherds from the Second Temple period (first century BCE–first century CE) and a few potsherds from Iron Age IIB (mostly from the seventh–sixth centuries BCE), as well as stone objects, animal bones, pieces of white plaster and a few remains of fresco and stucco. These finds were discarded beyond the city walls at the end of the Second Temple period, from the Hasmonean period until the time of the city’s destruction. The debris from the excavation was sifted and all the animal bones were collected, aiming to study the dietary composition of the Upper City’s residents. This area was also backfilled after its documentation. 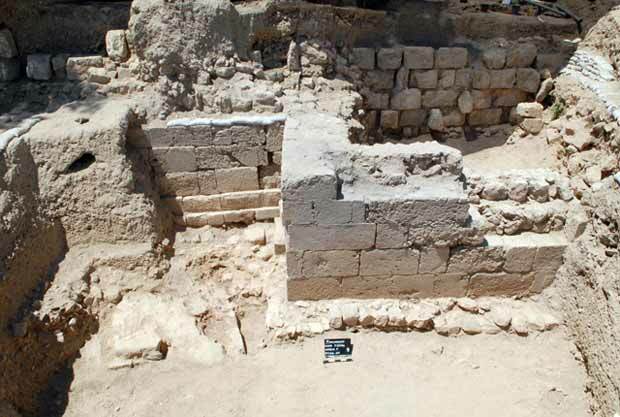 The renewed excavation along the southern slope of Mount Zion re-exposed fortifications that had been known from Bliss and Dickie’s excavations; a section of an ancient wall was discovered for the first time and layers of soil debris outside the city walls were excavated. Using research disciplines and methods that had not been sufficiently known during the former excavations in the nineteenth century CE enabled us to date the fortifications more precisely. The numismatic and ceramic finds dated the Byzantine wall to the fifth century CE and validated its identity with Eudocia’s wall, which is mentioned in a contemporary literary source by Johannes Malalas. An examination of the construction methods and their comparison to other city-wall sections that were discovered since the nineteenth century CE until the present suggest an earlier dating for the wall that was discovered for the first time in the excavation, linking it with the account of Josephus that the Hasmonean wall was built on the remains of a city wall from the time of the First Temple (The War of the Jews 5: 4, 2). 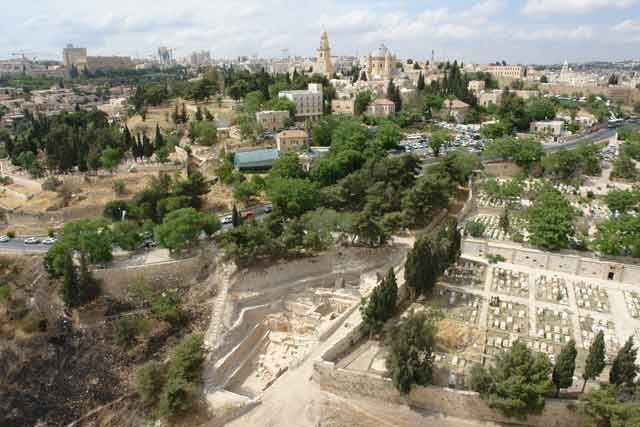 The excavation in the debris outside the line of the southern city wall indicates that the populated area did not extend beyond the boundaries of the wall and is likely to evince the dietary composition of Jerusalem’s Upper City population during the Second Temple period. 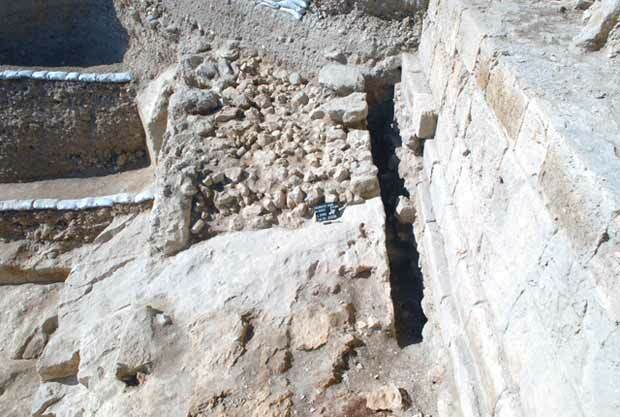 Consequently, the excavation adds another tier to our knowledge of Jerusalem’s development in the Mount Zion area. 1. The current excavation areas superimposed on Bliss and Dickie’s map. 2. Area T, aerial view to the north. 3. Area T, the three systems of fortifications, looking east. 5. 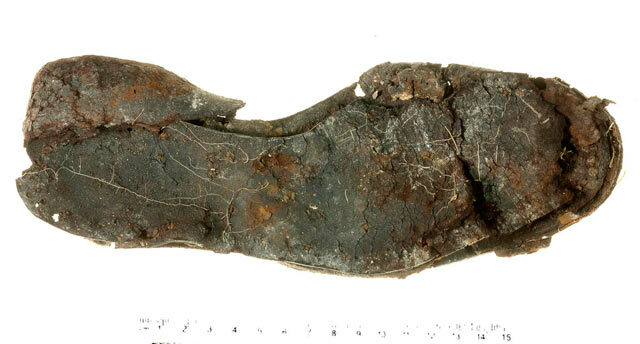 Sole of a shoe from the debris of Bliss and Dickie’s excavation. 6. Fortifications from the Byzantine period, looking north. 7. Corner of the tower from the Hasmonean period, looking northeast. 8. The line of the wall from Iron Age II(? ), looking west. 9. Area L, looking north.